5/11 Cup of Coffee: It was a tough day for Red Sox minor league affiliates, as the four teams scored a combined six runs on Sunday. 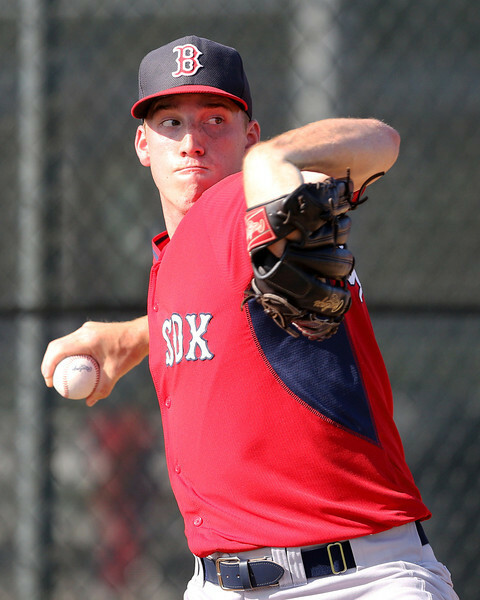 While the lower levels saw strong performances on the mound from Jalen Beeks and Teddy Stankiewicz, Henry Owens battled major control issues in an ugly outing for the PawSox. The Clippers completed the three-game sweep of the PawSox on Sunday. Starter Henry Owens struggled mightily with his control, as the Clippers scored three runs off of Owens in his four-plus innings of work without the benefit of a hit. Owens cruised through the first three innings, allowing just one walk. He issued two free passes in the fourth, but things really unraveled for Owens in the fifth when he threw 13 pitches, all balls, and walked three and hit a batter. The left-hander threw less than 50 percent of his pitches for strikes (34 strikes, 79 pitches) and now has walked as many batters as he's struck out (25) in 31 innings this season. It's the second time Owens has walked six batters in his six starts this year. Offensively, the PawSox couldn't get much going. Deven Marrero clubbed his third home run of the season, going to the opposite field while Quintin Berry went 1 for 4 with a double. Mike McCarthy held the Rock Cats to one run on five hits and a walk in his five innings, but wouldn't get the win thanks to some rough outings by relievers and sloppy defense from the Sea Dogs, who were charged with five errors on the day. First baseman Jantzen Witte made two of the errors. Robby Scott was charged with the blown save, allowing two runs (one earned) in his two innings of work, and Jonathan Aro took the loss with four runs allowed (two earned) in just an inning. Pat Light was the sole bright spot in the bullpen, tossing a perfect ninth. The Sea Dogs created some scoring chances, but went just 1 for 12 with runners in scoring position. Keury De La Cruz went 2 for 4 with a double, and Tim Roberson went 2 for 3 with a RBI. Teddy Stankiewicz tossed six solid innings, allowing just one run on four hits, no walks and four strikeouts, but a four-run seventh inning did in the Red Sox. Mike Adams relieved Stankiewicz to start the seventh and walked the first two batters he faced, and a series of singles and an error from Jordan Betts led to four runs, three of them earned for Adams. The left-hander's ERA ballooned from 3.00 to 4.20 with the ugly outing. The Red Sox had seven hits on the day, with four of them going for extra bases. Mario Martinez went 2 for 4 with a double, and Tzu-Wei Lin drove in a run with his sixth double of the season. The Drive were held to just three hits and let a strong performance from the pitching staff go to waste. Jalen Beeks tossed seven innings, allowing two runs on seven hits and fanning four. Beeks has shown good command all year, walking just four batters in 31 2/3 innings. Michael Gunn made his 2015 debut, throwing two hitless innings, walking one and fanning two. Rafael Devers had the only extra-base hit of the game for the Drive, going 1 for 4 with a double. Devers continues to hit well in the South Atlantic League, putting up a .340/.356/.505 in 24 games. Nick Longhi reached base twice with a single and a walk. Player of the Day: Though he's still searching for his first win of the year, 2013 second-rounder Teddy Stankiewicz looked very strong on Sunday, allowing just four hits, three of them singles. The right-hander knocked his ERA to 3.86 from 4.39 with the good outing, and for the first time this season, had a walk-free outing (though he did hit a batter). Stankiewicz has been tough against righties, holding same-handed batters to a .224 average in his 32 2/3 innings this season.